It takes an artist of true sensitivity to understand another great artist. 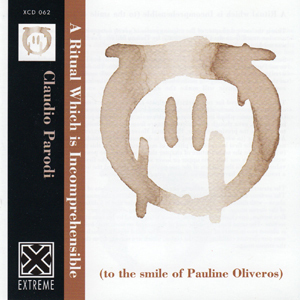 With “A Ritual which is Incomprehensible (to the smile of Pauline Oliveros)”, Claudio Parodi has spoken with the musical language of Oliveros, a musician he holds in great esteem. Having successfully paid homage to Alvin Lucier, Parodi takes a very different strategy to embody one of the world’s leading proponents of deep listening music. Importantly he brings to the album his talents as a Turkish clarinet player. Parodi manages to use the Turkish clarinet to evoke the sonorous harmony of the bandoneon as used by Oliveros. Additionally, he seamlessly integrates the sounds of the second track from “Suoni” by Tiziano Milani. This is the album that has inspired Parodi on his musical pilgrimage. In capturing the essence of Oliveros, “A Ritual which is Incomprehensible (to the smile of Pauline Oliveros)” reveals more and more on repeated listening. It is possible to simply let the music wash over you but there is so much more to experience. “A Ritual which is Incomprehensible (to the smile of Pauline Oliveros)” is the second of seven generative compositions that Parodi is recording for Extreme. Other musical luminaries to be showcased in the series include Charles Hayward, Yasunao Tone (of Fluxus) and Alvin Curran. This is the second chapter of the ongoing series of seven compositions, each of which freely uses one track from the CD Suoni (2005) by Tiziano Milani. For this piece, track n° 2 9’54” was used.Some words about the dedication. I have plenty of her records, but I have only had the occasion to see Pauline Oliveros performing live in December of 2006. The two performances I attended were gorgeous but what moved me more was the nice and gentle smile on Madam Oliveros’ face at the end of her playing – a smile which appeared also on the faces of the audience. I hope someday my music will make the audience and me smile in the same way…The piece is scored for two Turkish clarinets and two tapes. Using a reed instrument with overdub allowed me to achieve harmony, and helped me to move a little bit closer to Madam Oliveros’ music, whose instrument of choice is the accordion in just intonation, another reed instrument, even though of a different nature from my own. Being part of a series, I wanted to reference the previous chapter, Horizontal Mover, so I took excerpts from an interview with Alvin Lucier (to whom Horizontal Mover is dedicated) and transliterated them into pitches, using only the first lower eleven pitches of my clarinet. From this point on chance operations (which will be the main feature of chapter three) assumed the power. So the second part was written always one half tone upper or lower with respect to the first part, but I gave different values of time to the pitches of the two parts, and I shuffled the order of the bars, having as a result a richer harmony, even though using only two voices.The structure of the piece, talking about the clarinets, consists of three sections and a coda. The sections are made of twenty-four bars, always following the same melody, but – as described above – with different values of time, in a different order and in a different position in the panning of the stereo image. The breaths are different, giving silence a very important role. So, for the first section, one clarinet is left alone before being joined by his twin at the beginning of the second section. The same happens at the end of the second section, and, before the third section, there is almost two minutes of complete silence. The third section (which is introduced by one tape) sees one clarinet colliding with the codas, which are moving from the extremes to the center of the stereo image.For the realization of the tapes I used a similar procedure. I cut into four plus four parts the original stereo piece by Tiziano Milani and always compressed the parts in different values and then always put them in a different order. This created four left tape sections and four right tape sections, which start separately, being constructed by parts of different values of time but ending at the same time. The two tapes move throughout the piece from the center to the extremes and back to the center of the stereo image, and they are treated with increasing amounts of reverb, which makes them submerge the clarinets at the end of the piece. I like to think about that like cutting a diamond (Tiziano Milani’s piece) to produce a jewel to surround the ritual.Very special thanks to Lino Nobili.And on a very personal note; I recorded the piece the day after the death of my beloved cat, who was my daily little friend, and who was an attentive critic to my daily practicing and to my recordings. I’m missing him…Claudio Parodi, June the 16th, 2007Composed on May the 4th, 2007.Recorded by Paolo Valenti at Loud Music Studio, Genova, Italia on June the 1st and the 2nd, 2007. One cardioid microphone Neumann U89, two panoramic microphones OKTAVA MK 012, direct to hard disk. Mastered by Claudio Parodi and Paolo Valenti.